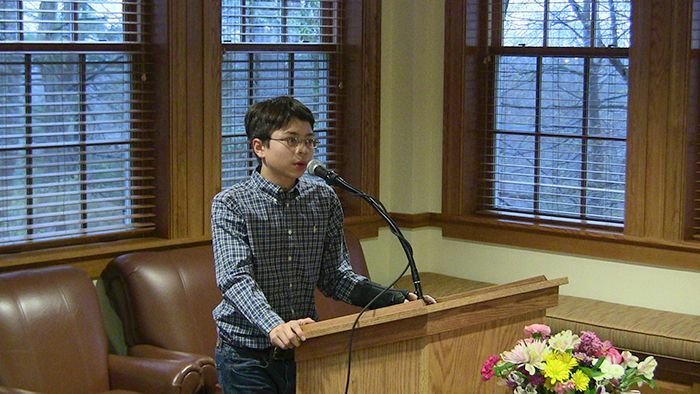 Burton Lyng-Olsen '20 reciting his poem at the annual Celebration of Poetry. In 2008, William J. Kneisel ’65 HGS, provided funds to honor his mother, a lover of literature and poetry, by expanding the collection in the Calarco Library. In 2008, William J. Kneisel ’65 HGS, provided funds to honor his mother, a lover of literature and poetry, by expanding the collection in the Calarco Library. Part of the funds established an evening of poetry, where students would recite and read their works in diferent languages. Hence, the annual Celebration of Poetry at Hopkins was born. In conjunction with this event, but separate all the same, is the COLT (the Connecticut Council of Language Teachers) Poetry Contest, an opportunity for students across the state to recite poetry and display their talent. “The poems are chosen by CT COLT; each year they approve a list of fve to eight poems for each language and level,” said Tilden Daniels, Chair of the Modern Language Department. For languages not taught in many schools, students can still submit and recite poems. “This year, Hopkins [qualifed] fourteen heritage speakers and 24 non-heritage speakers,” said Daniels. The contest was held on April 25, 2017, at Bristol Central High School, but transportation problems prevented Hopkins from attending. First-place COLT reciter Yasmin Bergemann ’20 also found the process to be rewarding. “My Spanish poem gave me a sense of popular culture, in addition to helping me with pronunciation,” Bergemann ’20 said. Many students emphasized calm recitation. “If you are relaxed and confdent, and don’t let your nerves get the better of you, you can really enjoy something as potentially scary as a poetry recitation,” Melchinger said.